In a previous post, from what seems like forever ago, I discussed what I felt was a moral obligation on my part to reduce faith and increase understanding. In this post I intend to talk about the Rules of Engagement that I have developed when engaging in these sorts of discussions. These are my personal rules, some may not find these necessary – but for me it draws a line in the sand as to what conversations are worthy of my time and attention, as I have a tendency toward extremes. If at least one of the following criteria are not met, I won’t bother engaging. Fear tactics are, much to the chagrin of more respectable believers, among the most common methods of proselytism going on in the world today; either by the threat of eternal torment in hell or by the threat of the wrath of one’s particular god. Using these tactics totally removes free will from an individual that is incapable of defending against it. Hell is more often thrown at me than anything else, and I find it offensive in the fact that 1: These people are stating that it exists as though it were true, even when they admittedly have no physical evidence to prove this and 2: It relegates ones faith to simply a reaction to an irrational fear. If your faith is the result of a massive fear of hell (something quite terrifying) then I’d have to judge that faith as unfruitful and unworthy of having. Normally coupled with fear tactics are Pascal’s Wager arguments, further proving that more often than not, if someone becomes a believer because of the threat of hell – then they are simply doing so as a desperate effort to save their skin. It is the terrorism of the evangelical world – as I’ve said before. Science is and has long been a friend to many an atheist. Most of us tend to study science, at least as laymen, and trust in its findings because we understand the nature of the scientific method. We put a certain amount of our trust in the scientific community because we know that they rely on empiricism and stringency; the scientific method contains fail-safes to prevent incorrect information from being published as if it were true. Even when those fail-safes don’t work, further investigation of published theories will ultimately lead to rejection. 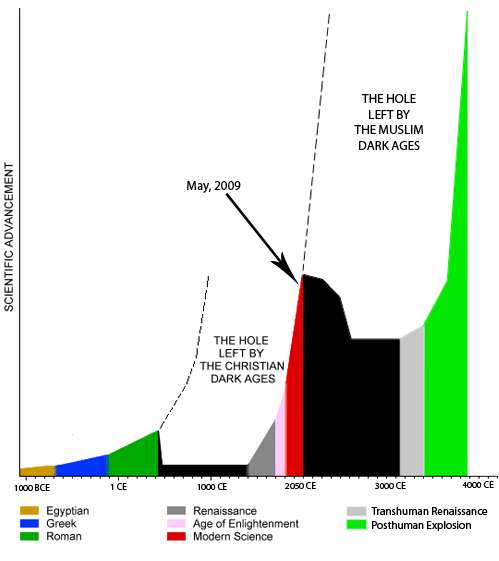 How scientific progress has been affected by religion through the millenia . Since science is far more reliable than faith, I feel that when someone attacks it I have a certain responsibility to correct them. Even if I won’t be able to convince the Young Earth Creationist that he is wrong, other members of the public forum will be exposed to a different and opposing view. Furthermore, when pseudo-scientific institutions like ICR, The Creation Museum, AiG, and people like Ray Comfort present their flawed pre-suppositional evidence for the creationist viewpoint and call it science, someone should be out there pointing out the fact that they are coming to a conclusion first and THEN looking for evidence. Real science is the opposite: there you come up with a hypothesis, test the hypothesis, compile the data, and conclusions are made. Never the other way around. Why did this make the list? The benefits of science in our world are everywhere around us and though it’s certainly had it’s bad moments (like the Manhattan Project) everything that I can think of at this moment that improves and extends the lives of people, helps us understand the world around us, and cures the most painful life ending diseases is a result of scientific discovery. Any time that science is attacked by the religious, we risk a return to the dark ages. Young people are a major target audience of evangelicals from every religion. Extremist Muslims recruit young people to carry out their dirty work for them, youth centered programs are a major focal point of every church I’ve ever been to, and young people are targeted by covert ministry operations that infiltrate schools in order to spread their message. “Teach them early” has been a long standing tradition, especially here in the South. Why is that a problem? Jesus Camp, a documentary released in 2006 exposed major religious indoctrination of young children. If you haven't seen this do so soon. The problems are multifaceted, but here are just a few: Kids just aren’t ready to decide that Jesus is their Lord and Savior (or insert other religious belief here)…they haven’t even ‘sinned’ enough to be in need of a savior, yet at every opportunity kids are getting ‘saved’. Anywhere from ages 6 to 16 these kids are being presented a message of salvation, generally by adults that they trust, as if this method of salvation is absolutely true and unquestionable. Many of them fall prey to this because they have little or no experience with critical thinking or have societal pressures to cave. Churches spend millions every year, especially during the summer with Vacation Bible Schools and different huge conferences (SuperWOW is what I used to go to). Kids are easy targets, the younger the better; though I believe youth pastors around the world are simply doing what they think is right, it just isn’t a fair shake for these kids. A real challenge for the youth pastors of the world would be this: Invite people of different faiths, also invite atheists (I’m more than glad to go) to your youth services or to your church’s main service. Let the kids ask questions so that they can get an understanding of belief systems from someone other than you. There is no better source for an understanding of Islam than a Muslim and the Qu’ran, and there is no better source for Humanism than a Humanist. Try it – set up some ground rules if you want, and try it. Though fear definitely falls under this category, it deserved its own section. The second most common method of evangelism in the world today, as far as I can tell, is emotional manipulation. One of the most frustrating and disrespectful things I’ve ever personally witnessed was at a funeral for a man that was particularly non-religious: the chaplain that he had been talking to prior to his death took the opportunity to present the Christian Gospel at the funeral while the family was still in shock at the loss of a father and husband. Rather than focus on the wonderful things about this man, Jesus became the star and the family’s pain was used as a tool to get them in to church and to become Christians. I’ve witnessed this multiple times at multiple funerals and it enrages me. People should be allowed to make decisions regarding the faith they pursue when they are at their best, not when they are dealing with immense emotional pain and other forms of weakness. It’s an unfair and unkind advantage that should be met with reasoned defense. There are countless examples that could be used, but I think my readers get the gist of what I’m calling unfair emotional manipulation here. Evangelical Christians are one of the largest voting blocs in America and as such have enjoyed the ability to legislate morality for the rest of us. In everything from the ability to buy alcohol when and where you want, to who has the right to get married; evangelicals consistently get exactly what they want because of a majority rules mentality. Some of these things are trivial, but when my gay friends that I love very much don’t have the right to marry just because evangelicals believe that their Bible should determine the context of the Constitution, that’s something with which I have a big problem. People are being disenfranchised in a country where freedom and liberty are supposed to be the foundational beliefs that bring our nation together – gay rights, abortion, and even liquor sales shouldn’t be voting issues – they should be assumed rights inferred by the Constitution. If you are an atheist and you aren’t active in the political spectrum, I encourage you to get out and speak up for other peoples rights because the “Moral Majority”, the TEA Party, and Glenn Beck are glad to strip people of them – we may be next. I’ll probably add more to this list later, but I think it’s definitely a good start. It gives us good reasons to deal with real issues intelligently and without being nit-picking jerks…in other words – when you sneeze and someone says “God bless you” – it’s fine to say thanks…Save it for real problems.